An early comedy detective show featuring two unlikely heroes, Detectives Black and Blue aren't too clever but they seem to solve crime in spite of themselves. An early comedy detective show featuring two unlikely heroes, Detectives Black and Blue aren't too clever but they seem to solve crime in spite of themselves. The characters Jim Black and Frank Blue began as shipping clerks in Duluth Minnesota but had a nose of solving crime and together opened an investigationagency. The duo is billed as "the world's dumbest and luckiest detectives." 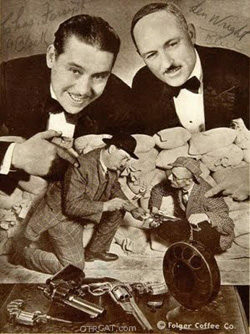 The show ran from 1933-1935 and over 300 shows were produced. This collection included all know recording of this popular series; the sound quality is exceptional for a 1930s production. See also: Big Guy, It's a Crime Mr Collins, and Kitty Keene. For more rare crime shows, see also: Rare Detective and Crime Shows Collection, Rarities: Adventure & Detective, and Dame Detectives, Female Crimefighters. 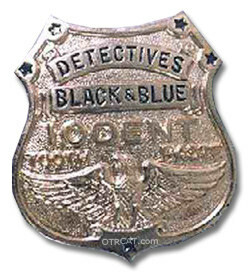 Be the first to comment on "Detectives Black and Blue"